You would think that if I could get myself as far as Lausanne, I would manage to go a little further and reach Zurich, to see at least part of the Kramnik v Aronian match. However I did not quite do this, and therefore missed seeing an entertaining match. In fact I did a better job of following the match while I was here in Australia, than I did when I reached Europe. So having returned home, I've just caught up with the fact that it ended 3-3. After 1 win each in the first half, neither player could make the breakthrough in the second half. However the final game looked quite exciting, with Kramnik giving up material in the hope of queening a pawn. In fact that this did happen, but after Aronian returned a rook, the game ended in a draw. Almost back in Canberra, with just an early morning flight from Melbourne to come. When I do get back, into into my normal rhythm, I will begin to post some more information from the RTRC meeting. I probably won't do it on this blog, as the subject matter is not to everyone's taste, but on my other blog. It will probably be a multi part extravaganza, as we did cover a lot of ground. Yesterday was so busy during the FIDE Rules and Tournament Regulations Commission meeting, that could not find the time to blog. So I'm doing this in between bites of toast at the breakfast table. By the end of yesterday we did get through all the received proposals for changes to the Laws of Chess. Some we accepted, some we did not, while others either require some more work, or will be put the the RTRC meeting in Istanbul. When I return to Australia, I will try and put up some note from the meeting so people can have a better idea of what is going one. But speaking of my return to Australia, I have a train to catch shortly, to being the 33 hour journey home. We are actually about half way through the first day of the FIDE Rules and Tournament Regulations Commission Counsellors meeting. The morning and early afternoon were spent on the "meat and potato's" of the first 5 articles on the Rules of Chess. These are the sections that define how chess is to be played, before adding in extra rules concerning competition play. Another definition, which did come up during the meeting, is the rules you would find if you brought a chess set from a toy shop. This afternoon will see discussion on more interesting, and possibly challenging, topics. This includes the default time, how to claim a draw by repetition, and a possible new proposal to add the recording of clock times as part of the items you are required to write on your scoresheet. BTW The commission chair is happy for me to blog, tweet and FB the proceedings, so if anything earth shattering is decided, I will try and keep everyone informed. I've just arrived in Lausanne, after 33 hours of travel from Australia. The trip was relatively stress free, although I still cannot stomach airline breakfast food (I can keep the other meals down, but not breakfast). Having done a similar trip two years ago on Emirates Airlines, I will say that Ethihad provides better in flight service (ie multiple drink runs). When I stopped over at Abu Dhabi Airport, I also bumped in to Dr Nigel Short. He was travelling back from Japan, where he had just played an exhibition match with a couple of top Japanese players. As our planes were departing around the same time we spent a couple of hours drinking coffee and having a chat. The only other ting I've noticed (apart from the 100+ TV channels I get to pick from), is that Facebook has locked me out, which I don't think is bad thing. So if I'm doing 'instant' updates from the meeting, they will most likely go out via my twitter feed. As I am travelling to (and from) Europe for the next 6 days, I expect only light blogging (depending on internet access). Hopefully I will be able to provide some updates from the FIDE RTRC meeting, as well as any other interesting places I get too. The website for the 2012 Olympiad has been up for a few weeks, although it is still a little light on details. While the obvious items like dates are are on the page, it is still missing some important information regarding accommodation and the actual tournament venue! I'm sure that these things will be known at some point in the future, but hopefully not too close to the actual start of the tournament. More significantly, while a number of teams have completed their selection process (including Australia), team registrations have not been opened yet. Lev Aronian scored a win in his opening game against Vladimir Kramnik, after it appears Kramnik's opening perpetration went wrong. Repeating a game from the European Women's Championship, Kramnik was wrong footed after Aronian found an improvement, and spent the rest of the game trying to hold the draw. However once Aronian had Kramnik's king trapped on the back of the board, the threats began to build up, and eventually Kramnik was not able to defend against them all. A couple of months back I reviewed "Exploration in Chess Beauty" by IM Andras Toth. At the time the book was only available in electronic format for the iPad (and related devices). Clearly the response to the book was positive, as the author fielded a number of requests from non-iPad users to make the book available in alternative formats. I'm pleased to say (as a collector), that the book is now available in the traditional print format (not that I minded the electronic version). While it loses the interactivity of the iPad version (you have to avoid glancing at solutions), it does allow you to flick through the book in a more familiar manner. Otherwise the differences between the two versions are so minimal, that it simply comes down to a matter of taste. The Aronian - Kramnik match begins tomorrow evening (Canberra Time), in Zurich Switzerland. Billed as the highest rated match in history, it is the first time two 2800+ players will meet in matchplay. The match is over 6 games, following a 2 games followed by a rest day schedule. You can follow the games live from the match website, while for those lucky enough to be in Zurich (including 1 ANU Chess Club member), there is no charge for spectators! Next week I'm off to a FIDE Rules and Tournament Regulations meeting in Lausanne, Switzerland, The purpose of the meeting is to look over rule changes that will be discussed and voted on at the FIDE Congress in Istanbul in the middle of the year. Some people I've spoken to wonder whether there is much to change in the Laws of Chess, given that the game has remained pretty much the same for hundreds of years. I explain to them that while the way we play chess hasn't changed much, how the rules are defined often needs work. This is mainly because for every rule there is a loophole, and while I understand that not all loopholes can be shut, the most obvious ones can. Having said that there are probably some rules that are still unclear, both in definition or practice, and we will be looking at those. One that has caused some comment recently (especially in Russia) is the correct way to promote a pawn. While the rule defines a clear and specific method for doing this (move the pawn to the eighth rank, and then replace it with the intended piece), there is also the common (but currently illegal) way of just removing the pawn from the seventh rank and placing the promoted piece on the eighth rank. Whether we allow both methods will be one topic of discussion. In fact it was this topic that caused some amusement at my chess club last night. The mother of one of the club's juniors asked me what I would be discussing when I was in Switzerland. "Pawn promotion" was my reply. "Oh gosh, really" she said. It took me a few moments to realise why she was giggling! "80% of success is just showing up", according to film director Woody Allen. In chess it certainly helps to turn up for your game, more so if your opponent then fails to do so. While there were a few 'no shows' at the Doeberl Cup and SIO, the rate was pretty minimal, given that almost 400 players were playing in both events. Probably the most significant one was in round 2 of the Doeberl Cup Premier, when GM Deep Sengupta failed to turn up against IM Praveen Kumar. Sengupta failed to realise that there was an evening round on the first day, and only wandered in to the tournament hall by accident. Not wanting to ruin Praveen Kumar's potential GM norm chances, I allowed the game to start late, with the agreement of both players. Surprisingly I received very little criticism for the decision, although after the game was played I myself thought I had made the wrong decision. The risks in being so compassionate were then demonstrated at the SIO when a number of players arrived on or just after the default time, and we ended up in a situation where players who were defaulted were aggrieved that others escaped such punishment (NB The SIO had a '30 minutes and a bit' default time, to take into account discrepancies between the times people were working off). Nonetheless I find forfeits in big tournaments less of an annoyance then forfeits in smaller club events. For some reason I regard getting a free point in a weekend event an occupational 'bonus', and missing out on a game is normally mitigated by having a number of other games to play. In club tournaments the damage is a little larger, in that normally it is the only game you play that night, and it involves a wasted trip to and from the club. Also, club forfeits tend to occur on the lower boards, which often affects newer club members, leaving a poor impression. So my plea to players, especially newer ones, is that playing every game you can is not only important to you, but also to your opponent, and if you cannot make it to your game, please inform the tournament organiser of you absence. Not only does it allow your potential opponent to get another game, but it is simply good manners. The quality of my opening preparation is a bit of a running joke amongst people who know me ("You actually do opening prep" is a comment I've heard on more than one occasion). Part of the problem is that I learnt a set of openings when I was young, and I can't seem to learn anything else. Every now and then I plan to change them, but something always gets in the way. As an example, at the 2010 Olympiad I decided to switch to the Bishops Opening, if I got 1.e4 e5 on the board. The first time this happened, it didn't turn out that well, as I dropped a piece around move 10, although I salvaged a draw after swindling my opponent when he was short of time. The second game was even worse as after 1.e4 e5 my hand picked up the knight and I played 2.Nf3. I was about 10 moves into a Ruy Lopez before I realised that I had played the wrong opening. Having picked up a copy of The Bishops Opening Explained by IM Gary Lane on the weekend, I decided to give it another go. Fortunately I remembered to out the bishop on c4, as it turned out to be an essential part of my win. My opponent wasted a couple of tempo in the middle game (as well as missing the pseudo sac 8. ... Bxf5!) and then decided that blocking the kingside was a reliable drawing method. However I was able to force a breakthrough via a knight sac, and fittingly my white squared bishop was the piece that captured his queen. GM Levente Vajda defeated IM Stephen Solomon to win the 2012 Sydney International Open. Vajda was tied with GM Attila Czeb going into the final round, but after Solomon staked everything on an unsuccessful attack, Czebe needed a win to catch up. However is was not able to get past GM Deep Sengupta, and could only draw. On board 3 FM Bobby Cheng also proved a tough nut to crack, and GM Gergely Szabo took a draw, although the position may still have been better for him. These results allowed Chinese IM Chongsheng Zeng to take a share of second after defeating defending champion IM Akshat Khamparia. The win was doubly fortuitous as he needed the full point to score a GM norm, although he seemed unaware of this, as he expressed surprise when I congratulated him after the game. The other players looking for norms were not so lucky, with FM Gene Nakauchi losing to GM Adam Horvath, and Dennis Ovcina losing to FM Max Illingworth. In the Challengers event, Donato Mallari defeated long time leader David Lovejoy in the final round to leave them both tied for first place. This brings the two weeks of the Doeberl/SIO tournaments to an end, I am sure a number of players are glad that it is over. Back to back tournaments played at 2 rounds a day is a tough ask, although I was pleased to see a number of players fighting until the very end. Overall is was a successful trip (in terms of prizes) for our visitors from Hungary and Romania, although the sizeable Indian contingent also took home plenty of rewards. Full results from the Sydney International Open and Challengers can be found at the tournament website. 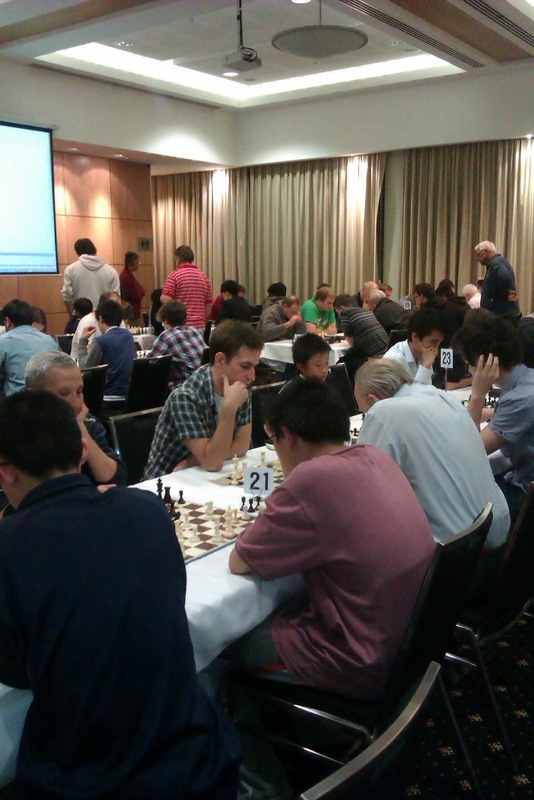 GM Levente Vajda and GM Attila Czebe share the lead going into the final day of the 2012 Sydney International Open. Vajda protected his tournament lead by drawing both his games today, while Czebe defeated Doeberl Cup winner GM Adam Horvath in round 7, before playing a hard fought draw against Stephen Solomon in round 8. As the two leaders have played each other already, the final standings will depend on a couple of different games. On the top board Vajda has black against IM Stephen Solomon, while on board 2 GM Deep Sengupta is playing Czebe. Australian FM Bobby Cheng also has a chance of taking a share of first, if he can defeat GM Gergely Szabo, and other results go his way. However Szabo is on the same score as Cheng so he is also motivated to win. The game to watch is GM Horvath playing FM Gene Nakauchi. Nakauchi's 8th round win over means he can earn an IM norm with a win tomorrow. Of course the result had the unfortunate side effect of ending Ikeda's norm chances. Play begins tomorrow at 10 am, with live coverage of the top 8 boards available from the tournament website. Day 3 of the Sydney International Open saw a number of hard fought games, as well as an indication the tiredness may be setting in. Round 6 saw a very quick draw on board 1 (10 moves) as GM Levente Vajda and GM Attila Czebe decided to conserve some energy for the later rounds. On board 2 GM Gergely Szabo (today's birthday boy) had the same goal, but did the same thing by beating IM Rathnakaran in a fairly short game. Of the Australian players, IM Gary Lane and FM Junta Ikeda stayed up with the leaders by drawing both their games. The round 5 game was against each other, while Lane drew with GM Horvath in round 6, and Ikeda with IM Zeng. The draw by Lane kept undefeated streak from the start of the Doeberl Cup alive. With three rounds to go, tournament strategy may be as important as tournament play. The overseas GM's may be looking for the simplest path to first place, while the norm hunters may be looking to maximise their title chances. I would not be surprised to see some quick draws in the next couple of rounds as a result, but there my be enough fight in the chasing pack to keep the leaders on their toes. Day 2 of the Sydney International Open saw a number of interesting games at the top of the tournament. In the third round IM Junta Ikeda IM Moulthun Ly played the Kings Gambit against GM Levente Vajda, but despite coming under a little pressure, Vajda was able to consolidate and earn the point. FM Junta Ikeda also had hopes to collect a GM scalp in the form of Attila Czebe, but had to be content with half a point after defending a slightly worse ending. Round 4 saw the leaders clash on the top boards, with Doeberl Cup winners Vajda and Rathnakaran moving to 4/4. They were joind by Chinese IM Chongsheng Zeng,who scored an upset win over GM Adam Horvath. The most exciting game of the night was further down with Olympiad aspirants FM Max Illingworth and FM Junta Ikeda paired on board 6. Illingworth held an advantage for almost the entire game, but could not finish off the resourceful Ikeda. Then with both players in time trouble Illingworth made a fatal pawn push, and Ikeda found a forced mate. Rounds 5&6 are tomorrow, with play commencing at 10am. Live coverage of the top 8 boards is available from the tournament website. Today saw the first two rounds of the Sydney International Open, and despite the general dominance of the top seeds there still a couple of upsets. In the first round Alek Safarian arrived 20 minutes late but still managed to hold the draw with GM Gergely Szabo. Round 2 saw a number of enticing pairings (IM Lane v FM Jones being a particular favourite) but a repeat of a round 2 pairing from the Doeberl Cup was the most fascinating. IM Praveen Kumar was paired with GM Deep Sengupta, as in Canberra, and at the appointed starting time Sengupta was once again not at the board. However he did arrive soon afterwoods (unlike Canberra) but Praveen Kumar played a very good game to upset his higher rated countryman. At the end of 2 rounds there 13 players on 2/2. Tomorrow mornings round will see a couple of young Australian players taking the overseas visitors on the top boards. Live coverage will commence from 10am at the tournament website. With the 2012 O2C Doeberl Cup out of the way, the action now moves to Parramatta for the Sydney International. There is an overlap between the two events (especially at the top), but the SIO has also attracted a number of strong local players. Top seed is GM Levante Vajda,with IM George Xie the top rated Australian in the 75 player field. The Challengers has attracted 62 entries, boosted by a significant western Sydney contingent. Pairings for both tournaments (including for the first round) are available at www.chess-results.com, while further tournament information, including live game broadcasts will be at the tournament web site. Play in the first round for both tournaments commences at 10:00 am, while GM Ian Rogers will be providing live commentary at the tournament venue, Parramatta Town Hall. The 2012 O2C Doeberl Cup ended in a 4 way tie for first place, after Indian IM K Rathnakaran defeated countryman IM P Karthikeyan in a dramatic last round game. Once the result of that game was known, GM's Adam Horvath and Gergely Szabo immediately shook hands to ensure a share of first place. On board 3 GM Levente Vajda then ground out a win against GM Deep Sengupta to become the fourth player on 7/9. Not only did the win for Rathnakaran leave him in first place, but he also scored a GM norm, and picked up a bonus $1000 as the sole recipient of the tournaments fighting fund. However the ultimate destination of the Doeberl Cup trophy was GM Adam Horvath who had the best tie-break of the 4 players. This year the event was dominated by the foreign players, although the depature of Zong Yuan Zhao due to ill health after 4 rounds did contribute to this. However a quartet of Australian IM's finished in the group on 6 points. These were IM Stephen Solomon, IM Gary Lane, IM George Xie and IM Moulthun Ly. One player who would have been delighted to join them was FM Bobby Cheng, as a last round win would have earned him an IM norm, but a loss to IM Akshat Khamparia dashed his hopes. In the Major Alana Chibnall drew her first two games, and then scored 5 straight win to tie for first with Michael Yu. However her slow start left her with an inferior tie-break and Yu took home the first place trophy. In the Minor tournament Dimity Li defeated previous tournament leader David Cannon to take first place on tie break ahead of Nathan Davidson. Full results from each of the tournaments, as well as the Saturday night Lightning is available from www.doeberlcup.com.au You can also download games from the premier from the results page (currently top 20 boards up until round 7, but more will appear in the next couple of days). The 2012 O2C Doeberl Cup is set for an exciting finish, with 3 players sharing the lead going into the final round. IM P Karthikeyan, GM Adam Horvath and GM Gergely Szabo are all on 6.5 points just ahead of IM K Rathnakaran and GM Levente Vajda. As Horvath and Szabo are drawn to play each other, the winning score will be 7 at a minimum, meaning only these players are in contention for first place. The board 2 clash between Rathnakaran and Karthikeyan is important for another reason, as one of the players will earn a GM norm from the game. Karthikeyan only needs a draw to reach the required performance rating, while Rathnakaran must win the score his norm. Further down Australian FM Bobby Cheng is the other player with norm chances, needing to beat IM Akshat Khamparia to earn an IM norm for himself. Untitled Australian player Tristan Stevens would have had an outside chance of an IM norm as well, but cruelled his chances by starting the event with 2 half point byes! In the Major tournament Michael Yu is half a point ahead of Nicholas Deen-Cowell, Tony Weller and Alana Chibnall. Yu plays Deen-Cowell, while Weller and Chibnall battle it out on board 2. The Minor is set for a similar finish with the fast moving David Cannon half a point ahead of Dimitry Lee, Nathan Davidson and Mark Patterson. Dimitry Li will try and stop Cannon's run, while Davidson and Patterson will hop a win in their game will earn a share of first place. Final round action begins at 9:30 am and you can follw the top 4 boards of the Premier, as well as the top board from the Major and Minor at www.doeberlcup.com.au. The big news from day 3 of the 2012 O2C Doeberl Cup was the withdrawal of 3rd seed GM Zong Yuan Zhao. Zhao had been unwell since the start of the tournament, but had struggled through the first two days. However his illness did not improve and so he had to pull out of the event and return to Sydney. Indian IM P Karthikeyan is the outright leader in the Premier, on 5.5/6. Having drawn his round 1 game against Yi Liu, he has reeled off 5 straight wins, beating GM's Szabo, Rodriguez and Vajda in successive rounds. He is closely followed by IM K. Rathnakaran and GM Adam Horvath on 5. Last night also saw the 2012 Statesman's Hotel Doeberl Lightning. This year was an 'up' year for the tournament with 80 entries, around double last years numbers. The field was also very strong, with a couple of IM's, and the usual large number of young 2200+ players. The winner was IM James Morris (for a second time), who defeated IM George Xie in the final round to score 8/9. Full results from all the tournaments are avail from www.doeberlcup.com.au. Today's play starts at 9:30 am and GM Ian Rogers will be doing live coverage at the venue. Once again Friday night was one for the night owls, with a trio of Premier games finishing around 12:30 am. Special mention has to go to GM Adam Horvath who was at the board from 1:15 in the afternoon until 12:30 the following morning, with only a 15 minute break between games. In round 3 he looked to be winning against FM Junta Ikeda as the game reached an ending, but Ikeda displayed his well known defensive skills and dug in. Eventually the position got down to an unusual K+QvK+RNN, with Ikeda trying to mate with the Rook and Knights. Normally a good judge of his clock, Ikeda overstepped the time limit after 6 hours of play, while still trying for the win. Hovarth then played another marathon, against Indian IM Rathnakaran, with this game ending in a draw half an hour past midnight. With these results, and a few others, there are 8 players sharing the lead after 4 rounds of the tournament. In what is probably an historical rarity, there are no Australian players in this group. However there are a few lurking half a point back, including IM Gary Lane, who spent day 2 drawing with GM's Czebe and Szabo. Day 2 also saw the supporting tournaments get under way as well. When the final entries rolled in, the total field was around 250, which may or may not be a record (and a total I thought would not be reached!). There was an especially large entry in the Under 1200 event, with 48 players on the books. While most of an arbiters best work is often done after midnight, sleep is sometimes a requirement. However most of the result pages for the tournaments are up (with the exception of the Major which will be done today), so if you go to the tournament website, you can find out all the results and standings, as well as download the games from the top 20 boards of the Premier (first 3 rounds). The 2012 O2C Doeberl Cup got off to a smooth start, with the first 2 rounds of the Premier being played yesterday. 79 players have entered the tournaments top section, including 8 Grandmasters and 13 International Masters. Such was the strength of the field, IM Andrew Brown found himself down on board 32 for his first game (and he was held to a draw by David Webster). In fact the first round saw a number of results that ran against rating, with a number of lower rated players earning draws against their higher rated opponents. Laurence Matheson drew with GM Attila Czebe, while 6 of the IM's had to share a point. This made being on half a point a tricky proposition in round 2, although only IM's Andrew Brown and James Morris drew a second time. At the top of the event there are still 12 players on 2/2. One of these players is FM Bobby Cheng he defeated Australia's No 1 player Zong Yuan Zhao in one of the final games to finish. Cheng held a pawn advantage, and although Zhao tried to complicate the position with very little material left on the board, Cheng was able to liquidate into a won position. Today sees the start of the supporting events, with around 240 players entered for the entire event. There will be the full opening ceremony for the tournament, and the launch f Bell Egan's book on the history of the Doeberl Cup. It all kicks off at 12:30pm and spectators are most welcome. Just a heads up on the sources of information for the 2012 O2C Doeberl Cup. Most of the good stuff can be found on the Doeberl Cup web page http://www.doeberlcup.com.au For now the first round pairings for the O2C Premier have been posted. You can also get the pairings and results from chess-results.com, click here for the direct link. Live coverage will also be available on the tournament web page, and I hope to have a cover-it-live blog running tomorrow. GM Ian Rogers will be doing video summaries of the rounds, and these will be up on youtube. At the time of writing there are 238 entries over the 4 tournaments, with a big jump in entries over the last 24 hours. Entries for the Major and Minor close at 12 noon on the 5th of April, while entries for the Under 1200 event can be made right up to the start of that tournament (1 pm Friday 6th of April). I'll also be putting up tournament summaries on this blog, although they may come in very late in the evenings. I might also have time to post photos and short videos of the action, and if I do, I will alert you via this blog (or my twitter account). The game of chess has long been viewed as a pursuit for nerds. But that’s totally going to change with Joseph Larson’s Thingiverse creation — a custom chess set where all the pieces come together to form a super robot ala Voltron. As a chessplayer, and someone who works in robotics, I'm going to argue that having a robot transformer chess set isn't going to make you less of a nerd. In fact it is going to crank the nerd factor up to 10 in my book. Actually, if you take away the chess component, and have anything that is essentially a toy robot (and you are over the age of 12), then you may as well turn the nerd amplifier up to 11. Just my 2c worth. I never really noticed 'material imbalances' when I was starting out in chess. Having been burnt early on by making a the 'beginners' exchange of Nxf7 Rxf7 Bxf7+ Kxf7 and then getting crushed, I tried to only exchange like for like. Probably Jermey Silman's "Reassess your Chess" was the first time I saw the topic covered in print, but by then it was probably too late to incorporate it into my game. One player who seems to handle such 'imbalanced' positions well is Gawain Jones. I've seen him do it a couple of times with my own eyes, and in the final round of the 2012 European Championship he decided that giving up a piece for 3 pawns was the right strategy. Of course this is a no-brainer in the ending, but in this case the game was still in the opening stages, where such sacrifices are frowned upon. However an exchange of queens made his task a little easier, and eventually the pawns triumphed. The 2012 O2C Doeberl Cup is only a few days away, so if you haven't entered you better do so now. Entries have passed the 200 mark, although barring a last minute rush, I cannot see the field breaking the record of 250 set a few years ago. This is a bit of a shame given that it is the 50th Doeberl Cup, but at least it will be special for those that do play. The Premier suffered a slight setback with a couple of GM's pulling out, including last years champion Andrei Deviatkin, who recently suffered a broken leg. Despite this he did make enquiries about whether he could still travel to the tournament, but was told that flying from Europe in that condition was very unwise. This means that there is room for only 12 more players in the Premier, so obviously now is the time to enter. A couple of people have been asking about the draw for the tournaments. As in past years entries for the Premier close at Midday Wednesday (4th April this year) and the pairings will be done in the evening, at the ANU Chess Club. The pairings for the Major and the Minor will be done on Thursday evening at the venue (Entries for these events close Midday Thursday). If you haven't entered but wish to do so then go to the Doeberl Cup website and fill in your details. No entries will be accepted at the venue.